With the World Heritage Site of Stonehenge, equally remarkable Avebury and the mighty Iron Age hill fort of Old Sarum, there really is plenty for the whole family to enjoy on a day out in Wiltshire. Discover the secrets of this seemingly ‘sacred landscape’ or get away from it all and explore a romantic ruined castle. Please note English Heritage have now switched to our winter opening hours, meaning that while many properties are open at weekends, there may be restricted access during the week. Please check opening times before travelling. 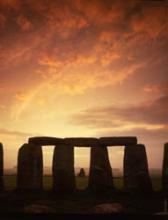 Visit Stonehenge! Sun worship temple? Healing centre? Huge calendar? How did they carry the great stones so far and build this amazing structure using only basic tools? Site of the original Salisbury, this mighty Iron Age hill fort was where the first cathedral once stood and the Romans, Normans and Saxons have all left their mark during 5000 years of history. Set in landscaped grounds beside a lake in peaceful Wiltshire countryside, these 14th century ruins provide a relaxed, romantic day out for couples, families and budding historians alike. The earthworks of a Neolithic henge and monumental mound, by a loop in the River Avon. Recent archaeological find of building equivalent to a priest’s quarters. Dating from about 2300 BC, markers now replace rings of timber posts, which once possibly supported a ring-shaped building. Discovered in 1925 when rings of dark spots were noticed in a crop of wheat.